What is wrong with Medicaid is that it cannot afford to pay for LTC for very many of us! Long-term care used to be a simple thing. We got older and needed some help, our children took care of us. Remember Ozzie and Harriet? She had the time and the space to have parents move in. She was a homemaker in dress and heels and pearl necklace. How many of your children fit that description? I didn’t think so. So then nursing homes were built, and nobody wanted to go to them. They were expensive and had lots of staff, but they were no fun. Still we did use them, and they did not cost too much, at first. Now most long-term care is done in your own home or the assisted living type facilities that look like hotels with pools and hot tubs and happy hour. They serve nice meals, have book club, walking club, water aerobics, movies and a lot of socialization – pretty nice actually. Home care agencies have sprung up all over, sending people to your home for bathing and dressing and medication management along with cooking, cleaning, shopping, and taking you to appointments. Then inflation happened and care is not cheap anymore. Nursing homes (only about 6-7% of all care) run over $10,000 a month. Assisted living is much less, starting around $3500 a month if you need no care, averaging $5000 to $6000 a month, unless you have dementia (half of all care) and then it goes to $7500 to $8500 a month. 40 years ago we retired at 65 with our home paid for, some savings, one car, a pension and Social Security. Today, many retirees carry a mortgage, credit card debt, 2 cars that cost $30,000 each, lots of toys and no gold watch. An extra bill of $60,000 to $100,000 every year is too much for our budget, and our children are all working and not able to take us in. Medicaid is a welfare program that will pay for long-term care (LTC) if we cannot afford it ourselves. Single people must spend everything down to $2000 before it kicks in. A married spouse at home can keep a house, car and some savings, but after the last death it all goes back to the state to repay Medicaid. This is NOT the problem, however. So, what is wrong with Medicaid? Just like there are less than 3 taxpayers paying taxes for every Social Security recipient, Medicaid cannot afford to pay for LTC for very many of us. So they pay far less than what it costs to keep you in a facility or at home. How long can you afford to pay an extra monthly bill that runs thousands of dollars a month when you are retired? Does this keep you up at night? Many people tell me it does. Have you ever investigated the insurance that pays for this care? You insure your house, your cars, your toys, possibly even death (which is not that expensive). Now that you know what is wrong with Medicaid, why not get insurance for the biggest bill you face in retirement? The one that bankrupts most people who try and pay it out of pocket? At TheLongTermCareGuy.com we have been doing nothing but helping folks deal with LTC bills for over 24 years. Helping them investigate APPROPRIATE insurance for LTC, or alternative solutions to protect a bit of your savings for family if Medicaid is inevitable. I bought my LTC insurance years ago and I can now pay for whatever LTC I might need. Every facility in the north east Wisconsin area wants me – and I’m not that good looking! I won’t need to burden my family, I won’t need to search for a place to take me. And if I do not like where I am, I am free to go elsewhere because I can easily pay for the care without going broke. I can sleep at night, can you? Hope this helped you see what is wrong with Medicaid. Please let contact me any questions so that I can help you and your family! 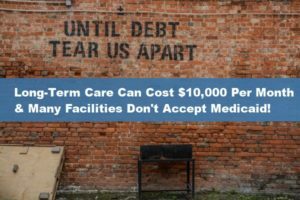 Call Romeo Raabe, TheLongTermCareGuy.com at (920) 884-3030 and investigate what you can do about this, and avoid searching for a care provider on Medicaid’s woefully inadequate reimbursements.